Sharing from Nami Kim and her team. 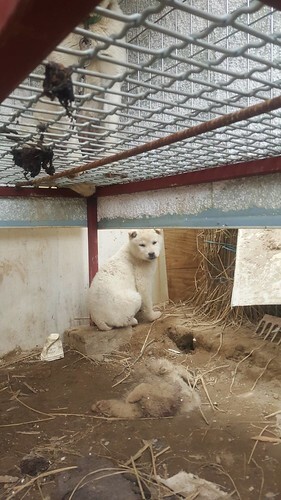 On February 10, 2016, Nami Kim and her team stumbled upon a small scale dog farm in Bucheon where the owner was breeding dogs for their own and neighbors consumption. 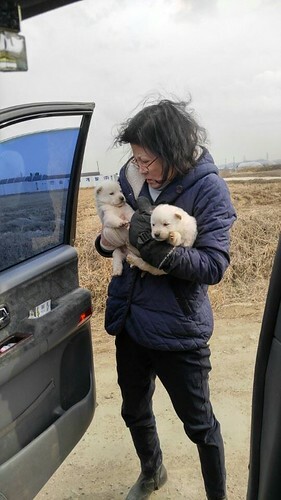 They succeeded in rescuing all 15 dogs and puppies. Click HERE for the Nami’s Facebook post! While we were checking out new locations to serve as a temporary dog santurary we came upon a man breeding dogs. 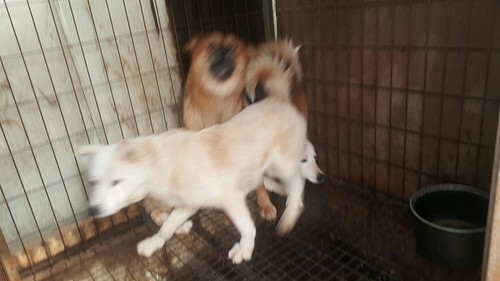 He was breeding three dogs to sell to the dog trader that makes his rounds to this village in Bucheon. 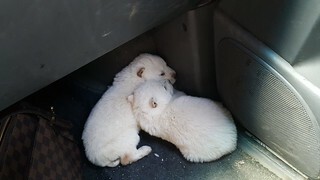 We are working with the city official to have the dog breeder surrender the dogs to us next week. Today’s rescue was unexpected. We were out looking at a few places to move the dogs, a new temporary sanctuary. There we saw a dog farm with 15 dogs. We were able to rescue four dogs today. 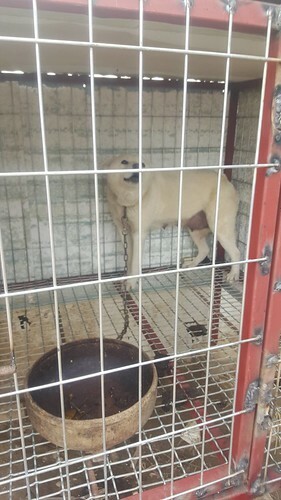 We will need to further negotiate with the butcher in order to try and rescue the remaining dogs. 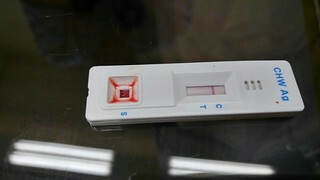 We took the two pups and two Jindo adult dogs immediately to Dr. Hong as they looked sick. 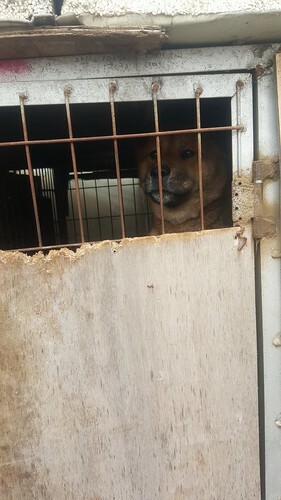 We observed a total of 15 dogs (one was found dead) at this dog farm we stumbled upon. The dog trader will not release all the dogs to us at this time. We were able to get four dogs today. The four dogs we rescued looked sick. We will need to further negotiate with the dog trader to get the remaining dogs. In the mean time I will take legal action against this dog trader. 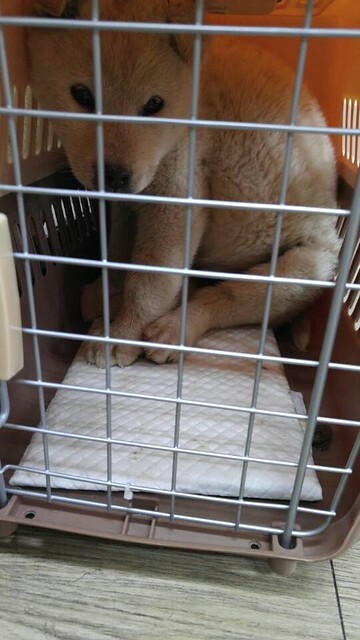 We took the two pups and two Jindo adult dogs and went immediately to Dr. Hong. 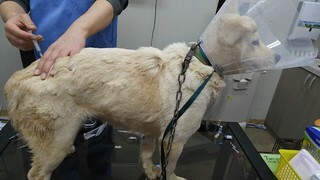 The four rescued dogs are at Dr. Hong today. 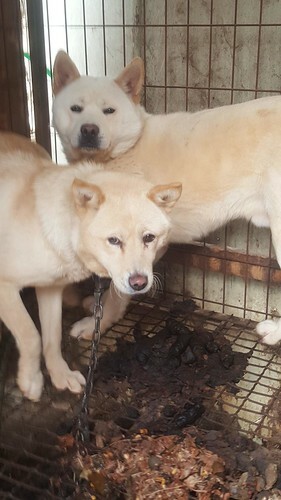 Thank God the two Jindo adult dogs are free from heart worm. The two pups are too young to have the heart worm. They are safe with us. 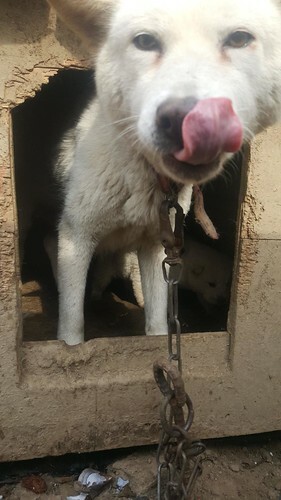 The dog meat trader just called me to say he is willing to surrender the rest of the dogs to us and asked me not to report him to the district office. 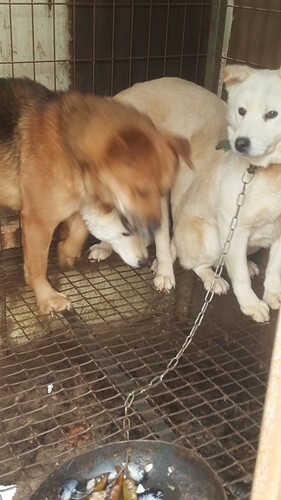 It is a natural reaction for dogs being taken out of the wire cages by humans to resist and fight as this action means “Death” and destined to get slaughtered for the meat. Every rescue, it is tough taking these dogs out. 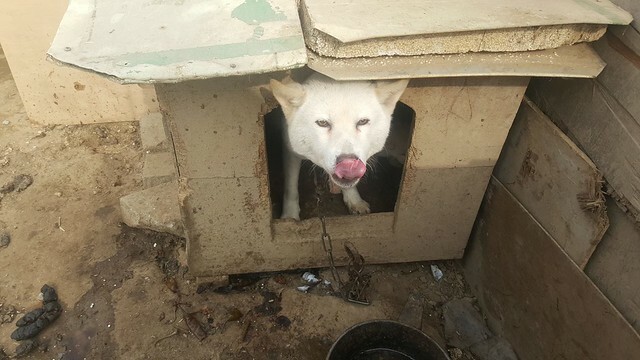 We named this young Jindo girl “Jenny” as she is the first one to be set free. Click HERE for Nami Kim and her team’s Facebook page for the latest updates! 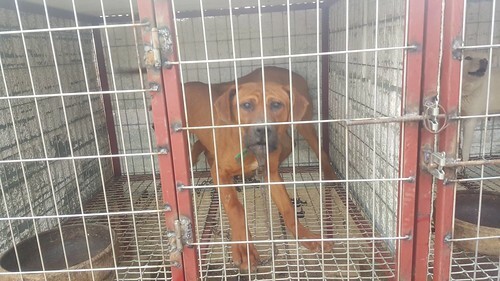 Donate to help Nami Kim and her team continue their rescues! 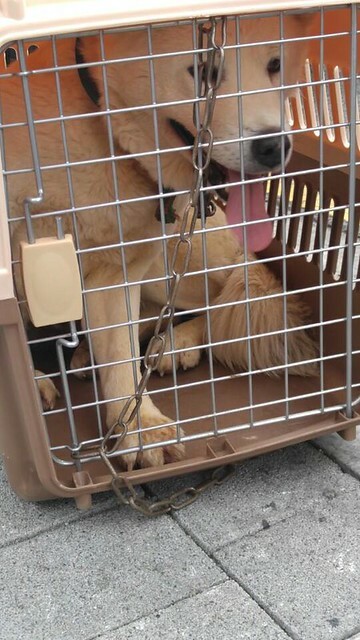 I am so grateful for the good work you are doing in rescuing dogs destined to be food. Thank God for people like you in Korea. Please keep it up. Don’t show mercy to these cruel butchers. Ditto to what Jocelyn Ng Kam Fong says. There are not words to describe the power and the endurance of Nami Kim. I wish I could help more than with some poor words. I can’t even send even a euro since my country is under capital control. Still, I am so grateful for her work. DEAR NAMI AND ALL HER TEAM WORKERS….. THEY ARE ALWAYS IN DANGEROUS….HEARTBREAKING SITUATIONS. THEY ARE WORKING SO HARD RESCUING ALL THESE PRECIOUS PUPPIES, DOGS FROM THE PITS OF HELL. THEY CANT DO IT ALONE. I WILL BE SENDING A DONATION TONIGHT. THEY NEEDS THE FINANCES TO CONTINUE. IF EVERY PUPPY/DOG WAS SPAYED AND NEUTERED THAN NO MORE DOGS WOULD EVER SUFFER AGAIN THIS BRUTAL MEAT TRADE. THANKYOU SO MUCH! THANK YOU SO MUCH! This keeps me alive. I only live and pray for the animals be safe and I’m so happy for this. Thank you so much! Nami Kim and team, you are my heroes! THANK YOU FOR BEING SO WONDERFUL! Thank you! You are a very brave woman! God be with these wonderful rescue people . Please get the poor dogs out , you have so much support behind you . I hope and pray this evil disgusting cruelty to the dogs and cats be stopped for ever ! Brilliant work, Nami! I wish there were more heroines like you! The best of luck, we are all behind you! Bless you! You are doing so wonderful work Nami. I wish strength for you!